For the past nine weeks, I have embarked upon a (seemingly) never-ending goal to chronicle each and every appearance of my beloved Karnilla the Norn Queen, no matter how big or small. The journey has had its ups and its downs, and I feared that after last week’s fairly random collection of small cameos, that we had already reached the pinnacle of storylines the character had contributed to in its long history. 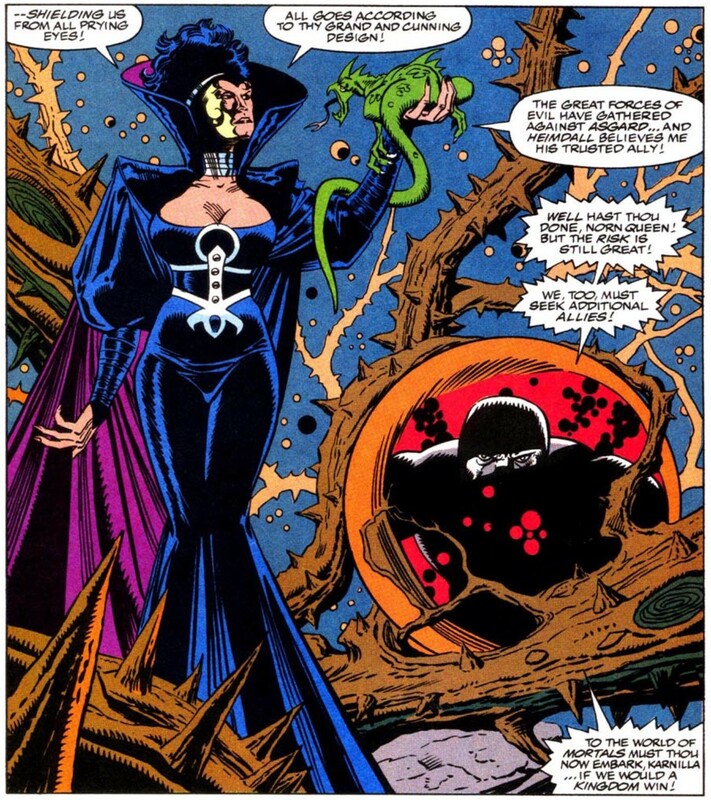 While that may still be true, there was still some life in her yet, thanks to Tom DeFalco and Ron Frenz. How much life? Well, read on, my friends. 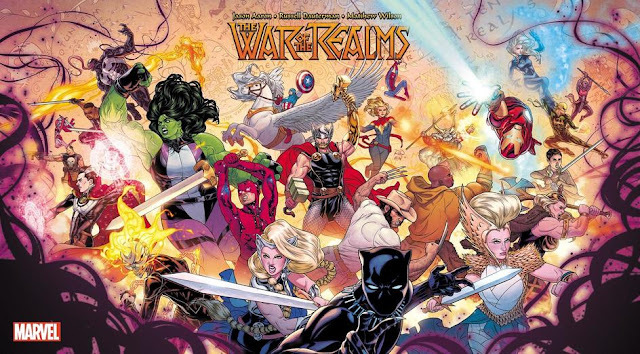 In this week’s collection of comics, Karnilla’s appearances jump back and forth from the primary storyline of each comic, to the “Tales of Asgard” backups. In case you’re wondering about the multiple art styles and the double credits below. Heimdall meets with Karnilla, to try and convince her to unite their realms against a coming darkness. I guess Olliffe would get the chance to draw more Karnilla. Good for him. 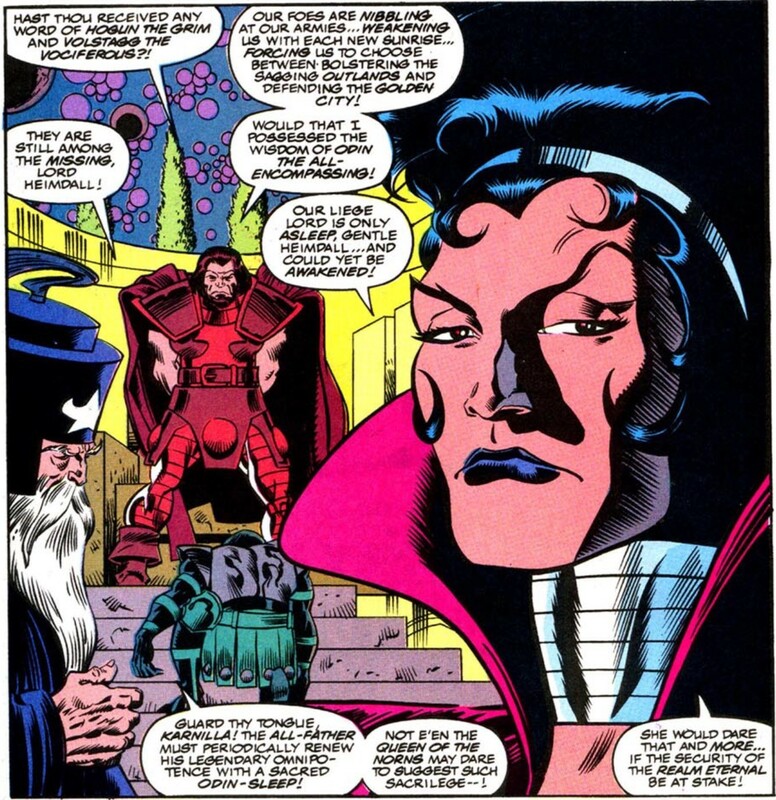 Later, flanked by Uroc (who looks like he was taken straight out of Mignola’s Hellboy) and Skoll the Wolf God, Karnilla believes they will need further allies in their plot against Asgard. Allies from Midgard. 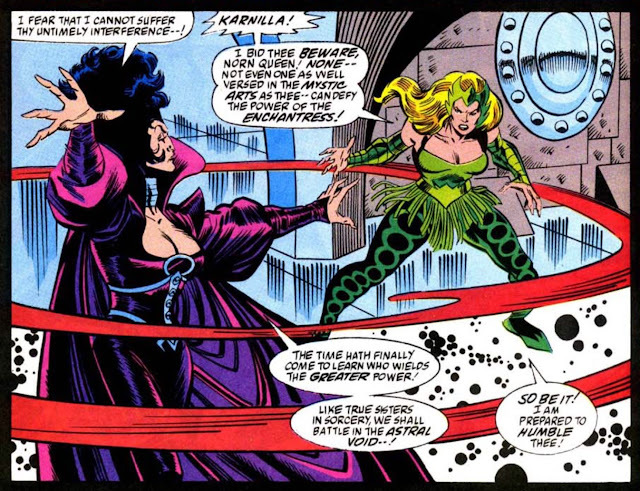 Karnilla contacts the Enchantress, to attempt to recruit her into joining the forces that amass against Asgard. Heimdall is worried about the increasing boldness of Asgard’s enemies, and the shortage of available heroes present to combat them. 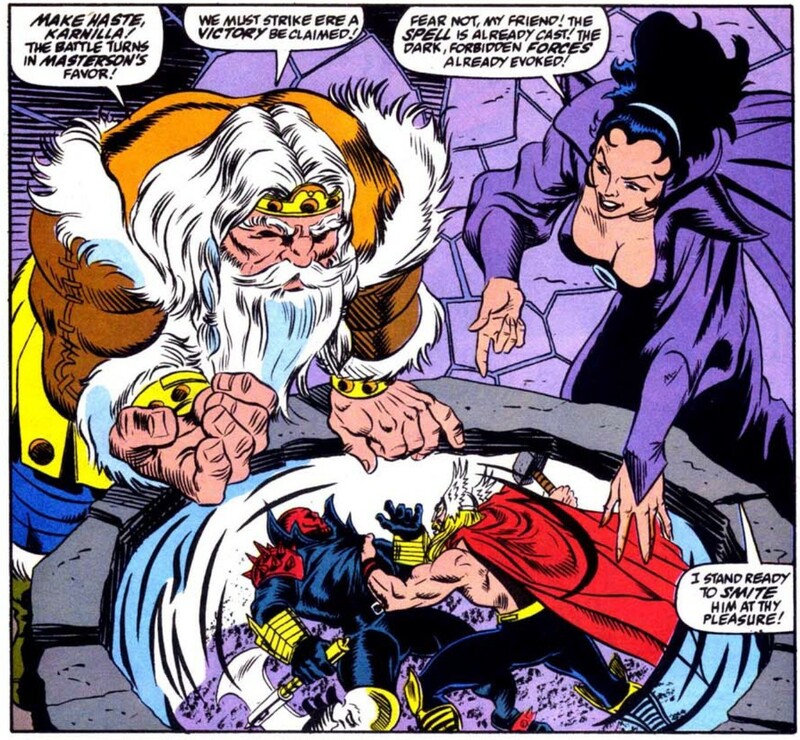 Karnilla offers to magically awaken Odin from the Odin-sleep. Later, ignoring the protestations of the Vizier, Heimdall allows Karnilla to try and wake the mighty Odin. Back on Asgard, a distinctly shady looking Karnilla claims not to have been able to rouse Odin from his slumber. I stated last week that I enjoyed a good bit of DeFalco and Frenz on Thor. However, I gave up once Eric Masterson took over completely, because I’m pretty sure no one but Duy ever wanted to read that [I have never read Eric Masterson's Thor. He is the single worst Mjolnir wielder prior to the 25th century. -Cranky Editor]. I am kind of surprised just how long their run on the book was though. They did the 400th issue, and now they’re about to 450. That’s impressive. Karnilla again confers with her mysterious ally in treachery. (It’s got to be Loki, right?) 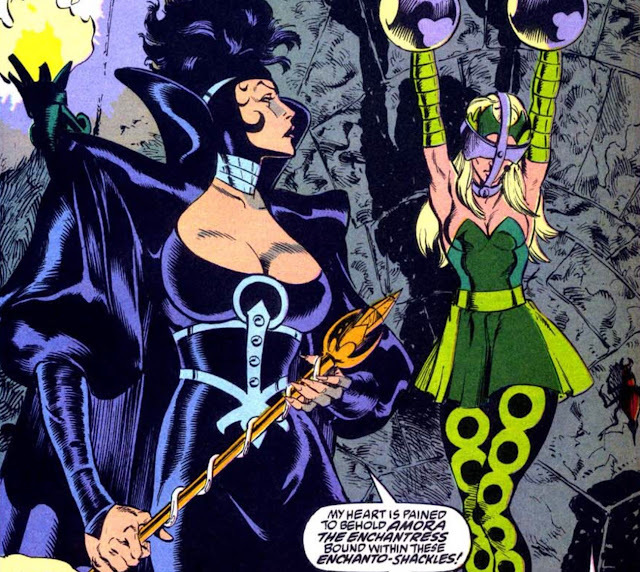 Enchantress, having rejected Karnilla’s previous offer because of her love for Heimdall, has made her way to Asgard. 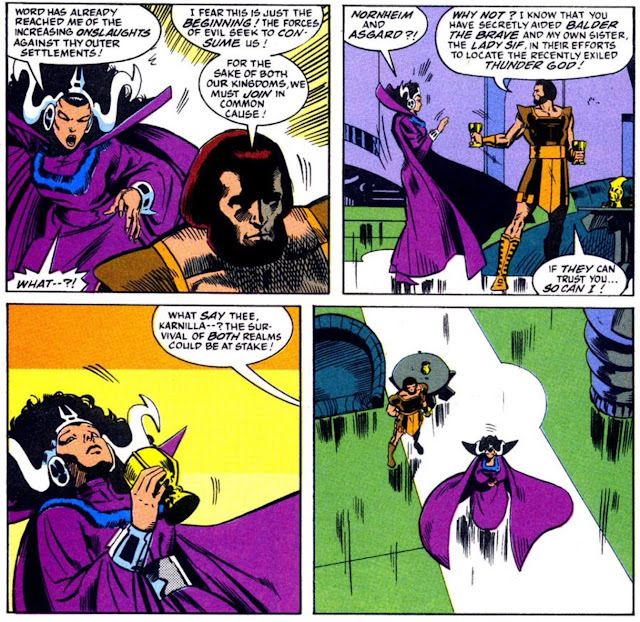 Karnilla bursts into Odin’s chamber, but is stopped by Heimdall before completing her scheme. 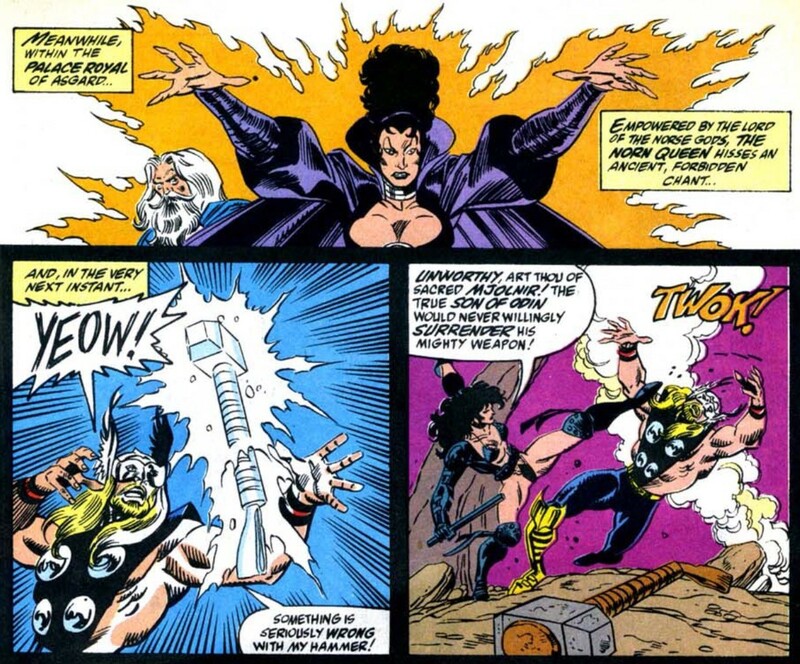 Karnilla warns the false Odin about underestimating the Eric Masterson Thor. Later, on Midgard, a villain named Bloodaxe interrupts Masterson Thor, Sif, and Balder’s pizza lunch. Karnilla visits the captive Enchantress, shackled in a dungeon deep within the Royal Palace. Enchantress warns Karnilla to let her go free, but she says her fate is in the hands of (the false) Odin. (Most likely really Loki.) 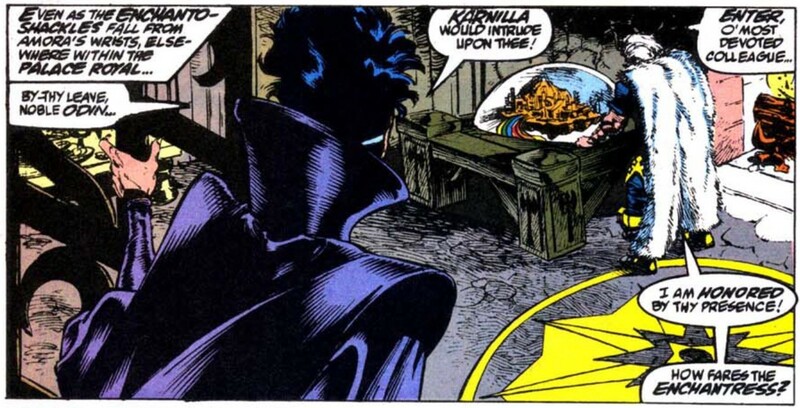 Karnilla visits with the false Odin (who is probably Loki, right?) even while Amora is already making her escape. 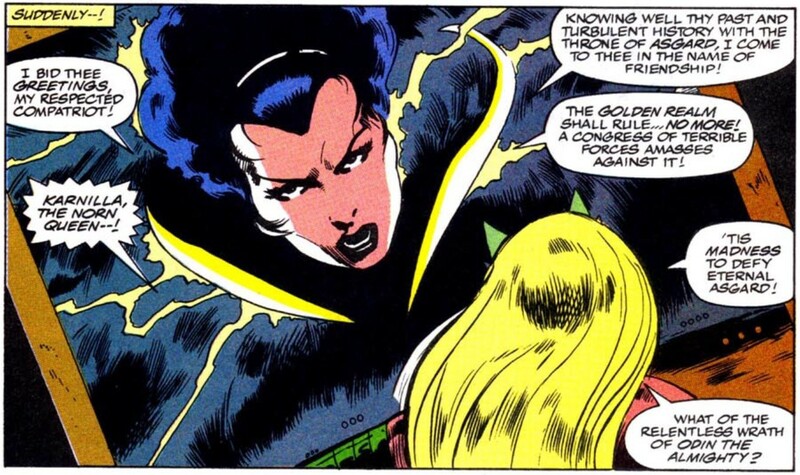 Little does the Enchantress realize that this is all part of their master plan, I guess. Karnilla strikes Masterson Thor with an energy bolt from the sky, stunning him long enough for Bloodaxe to gain the advantage in their titanic struggle. Masterson Thor battles with a Sif corrupted by Mephisto (complete with a leather fetish outfit straight out of the Claremont playbook). A young guardsman named Arko overhears the villainous plotting of false Odin and Karnilla. Arko looks like a character straight out of the short lived ‘80s cartoon Visionaries: Knights of the Magical Light. I think one of the characters names might even have been Arko. Or maybe I’m thinking of Orko. Either way, Visionaries met a quick and undeserved death. Someone should revive that property. Also, I’m more than willing to take any of the old toys off anyone’s hands, free of charge. So hologram-ey. Meanwhile, Arko had run off to the Warriors Three to tell on false Odin and Karnilla. 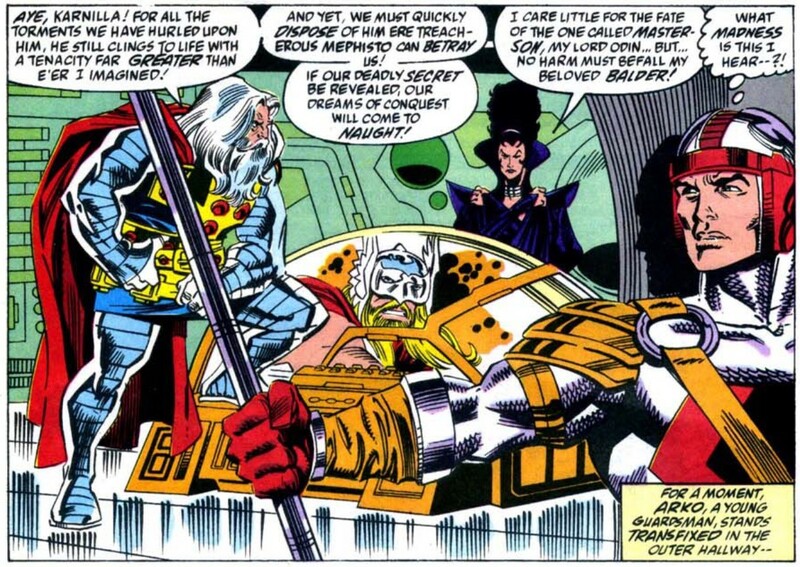 The Warriors Three confront false Odin (Loki, am I right?) and Karnilla, but fall quickly to their combined power. A group of loyal Asgardian warriors plead with false Odin to spare the lives of the Warriors Three, but are angrily turned away. 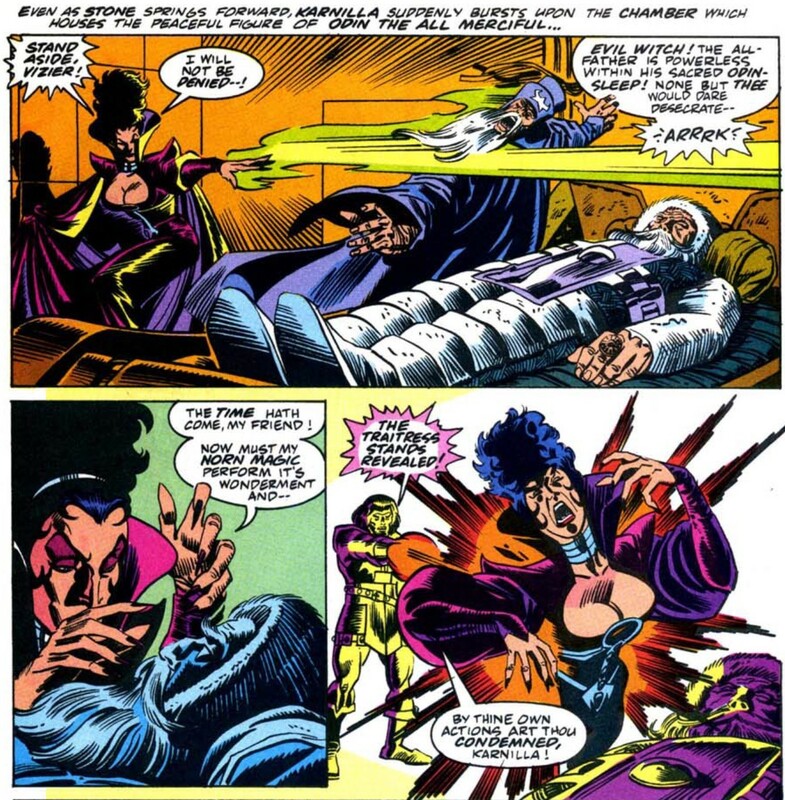 Karnilla suggests that maybe false Odin (definitely really Loki, I’m thinking) should heed their plea not to execute the beloved Warriors Three. 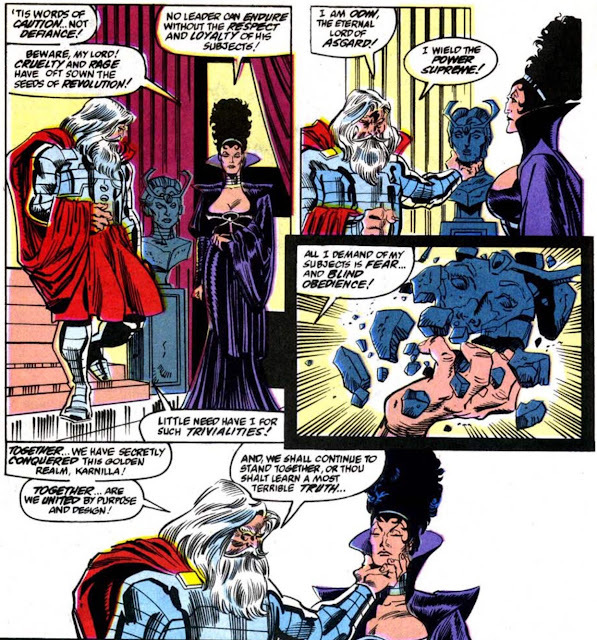 False Odin reminds her that he doesn’t need their loyalty, because he wields the power supreme, and that if she doesn’t like it, she can face his wrath as well. The forces of good converge upon the Loki/Odin on Asgard. Karnilla intercepts fetish Sif (no doubt inspired by Byrne) and her beloved Balder, ensnaring them in massive vines. Karnilla pleads with Balder not to try and resist, that hurting him was never part of the plan, but she’s interrupted by the arrival of the Enchantress and the Warriors Three. 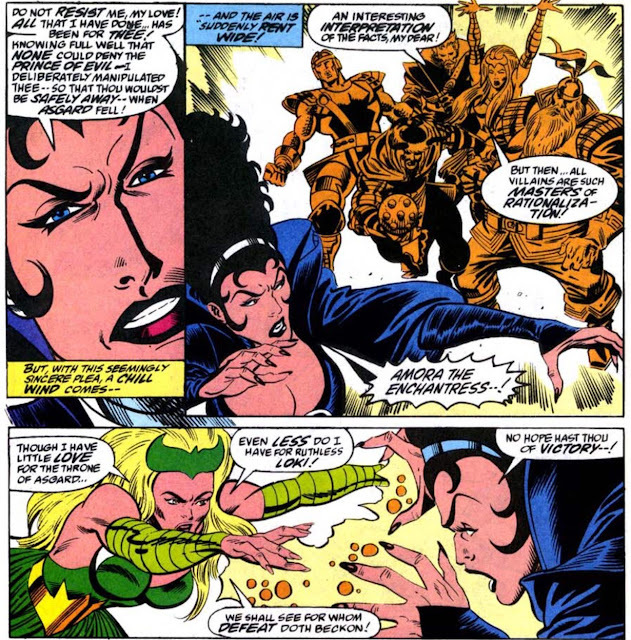 Enchantress squares up against Karnilla again, while the Warriors cut loose Balder and Sif. Karnilla calls to Balder to assist her by using the Norn Stones she entrusted to him earlier in his quest to locate Thor. Balder is torn between his love for Karnilla and his love for the realm, but ultimately chooses Asgard. 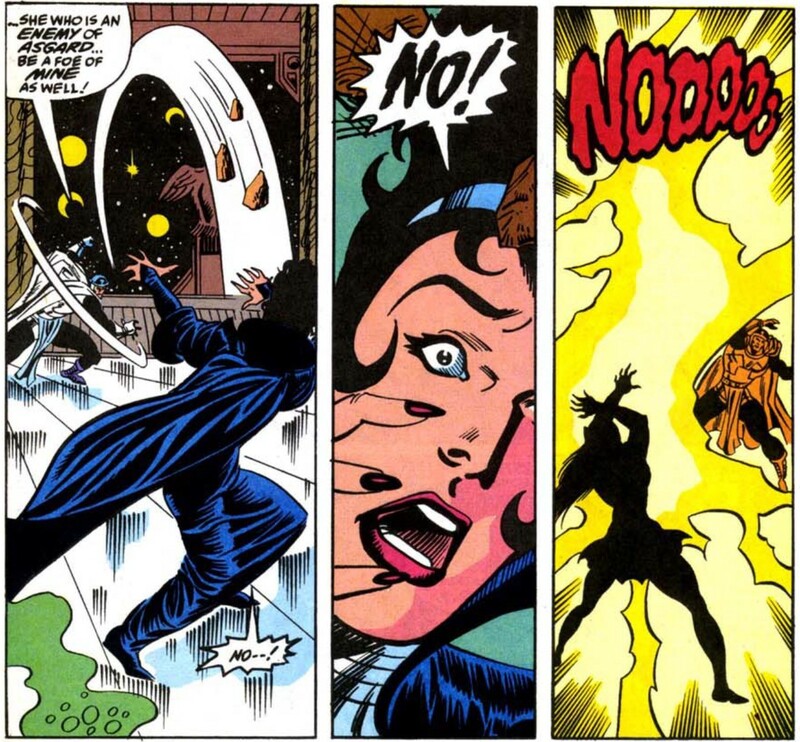 Karnilla disappears in a flash of energy, thus ending her role in this tale. Ultimately, the true Odin returns to his body, banishing the spirit of Loki into the hands of Mephisto and his dark realm for the time being. I’ve been saying for a few weeks that I was surprised how little Karnilla would appear following Walt Simonson’s fantastic run on the Thor comic. I assumed this based on how small the list of her appearances looked, but I guess I should have known better. There was little chance that the ultimate homage guys, DeFalco and Frenz, wouldn’t use Karnilla in some capacity. She ended up being a relatively significant part of this storyline involving Loki once again usurping the throne of Asgard. It’s one of the few times she’s been able to operate largely independent of Balder, and despite a return to a more evil version, I enjoyed it quite a bit. A welcome surprise, since after last week I was expecting a long string of random appearances and insignificant plot device cameos. Hopefully I continue to be proved wrong, and we have more quality Karnilla on the horizon.